The Black Harrier is a graceful, medium-sized, charcoal-black bird, with striking white markings, piercing yellow eyes and a long barred tail. It is a rare endemic raptor with restricted distribution that is mainly centered in the fynbos and Karoo areas of the Western and Eastern Cape of South Africa. Peripheral populations occur in the grasslands of Free State, Lesotho and KwaZulu-Natal and in north-eastern South Africa, Botswana and Namibia. It has lost over 50% of its breeding habitat in the last century from changes in land use patterns because of agriculture and urbanisation. As a result it has a restricted range and a small global population (1000-2000) and so it is categorised as Vulnerable. The Black Harrier is a beautiful, eye-catching bird that has black feathers, an obvious white rump, a striking black-and-white striped tail and silver wing panels. Sexes are similar with yellow legs, eyes and cere, but the male has greyer primaries and a more coal-black plumage than the female. Females are generally 15-20% heavier than males. The Black Harrier has a body length of 45-50 cm, weighs between 400-600 g and has a wing span of 1 m. Juveniles have dark brown upperparts with tan feather edges, sand-coloured under parts and blackish streaks on the breast and flanks. Black Harriers undertake seasonal migrations into either northern or eastern areas of their natural range. For example, some populations are known to migrate 1000 km eastwards across the Great Karoo and into the Lesotho highlands just as the rains begin, and when Ice Rats (Otomys sloggeti) breed in March-April. Other individuals stay in their breeding area and move into areas comprising a mix of agriculture and natural vegetation, such as Cape Columbine and the Overberg and some migrate between South Africa and Namibia. Breeding-pairs nest semi-colonially and during breeding season Black Harriers can congregate in large numbers at suitable breeding grounds along the coast and montane areas, including in the West Coast National Park in South Africa. These birds are generally silent, but make a high ‘woep-woep-woep’ display call in spring when sky dancing. The females call a high pitched ‘pseew-pseew-pseew-pseew’ when soliciting for food and a loud ‘chak-chak-chak’ when alarmed by predators near the nest. The males make a barely audible ‘purrdk’ contact call when approaching the nest with food. The Black Harrier is restricted to southern Africa, where it is mainly found in the fynbos and Karoo of the Western and Eastern Cape. It is also found in the grasslands of Free State, Lesotho and KwaZulu-Natal. The northern limits of its distribution are in north-eastern South Africa. They are also found in Botswana and Lesotho (non-breeding birds), with a tiny population in northern Namibia. This species prefers coastal and mountain fynbos, highland grasslands, Karoo sub-desert scrub and open plains with low shrubs and croplands. Harriers breed close to coastal and upland marshes, damp sites, near vleis or streams with tall shrubs or reeds. South-facing slopes are preferred in mountain areas where temperatures are cooler and vegetation is taller. During the non-breeding season they will also be found in dry grassland areas further north and they also visit coastal river floodplains in Namibia. The Black Harrier prefers hunting for small mammals in open grounds with low vegetation. Mammal prey comprises mainly of rodent species such as Otomys and Rhabdomys. Although mammals, as well as reptiles and birds are caught in coastal sites, birds (especially quail) are preferred in the diet of pairs nesting in mountain terrain. Variations in local breeding numbers of harriers may correlate with cycles in the populations of its prey, which decrease or increase in number with rainfall, especially in the drier areas. Most birds are monogamous, but a small percentage practice polygamy (one male, two females with different nests). Polygamy is more common in the mountains than at the coast, but less than 10% of all pairs practice this mating strategy which is generally detrimental to the secondary females. They build their nests of dry stems, grass, reeds and/or weeds on the ground. They usually lay three to five eggs which are incubated for about a month. In south-western South Africa, egg-laying takes place between June-November, with peaks in July and September. Nesting sites are mainly found along the coastal strip in dune thicket and in mountain fynbos habitats. Breeding success in coastal habitats is high and nests are usually found in loose groups around wetlands. 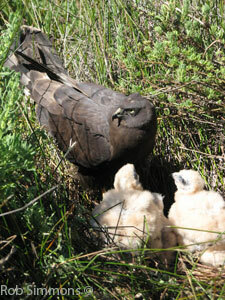 In contrast, breeding success in mountain fynbos is low because of high levels of nest predation and low food supply. In mountainous habitats, it appears that the abundance and availability of prey may be low resulting in birds travelling long distances to look for food in lowland croplands. The high energetic demands of these long distance flights may lead to reduced food supply to the young leading to low nestling survival and growth rates. Pairs may nest in loose colonies of 3-15 pairs, with some as close as 50 m apart, but generally 200-400 m apart. The young fledge after about five to six weeks. The Black Harrier research team, lead by Dr Rob Simmons is housed at the Percy FitzPatrick Institute of African Ornithology at the University of Cape Town. They are also the BirdLife Species Guardian for the Black Harrier under the global Preventing Extinctions Programme.The main enemy of the Black Harrier is habitat change caused by agriculture, urbanisation and alien invasive plants. High pesticide residues in agricultural areas may result in low hatching rates for eggs, and pesticides can also result in the death of adult birds. 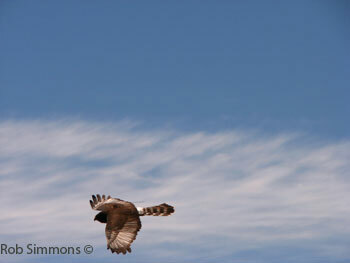 Harriers share one morphological trait with the owls even though they are not related to them. A facial ruff surrounds the eyes allowing them to funnel sounds into the ears. This in turn allows hunting birds to locate mice in deep vegetation. A second trait is the very light wing loading (low body weight combined with large wing and tail area) – allowing them to spend hours on the wing. They cover up to 20 km in single foraging trips and can cover 350 km in a single day on migration. Because of its dependence on pristine patches of indigenous vegetation the Black Harrier can be a good indicator of the status and health of their preferred habitat. Research in the Overberg for example shows that the presence of breeding Black Harriers indicates high mice diversity and high bird numbers. Thus the presence of a Black Harrier on your property means it is rich in biodiversity. Black Harriers will regulate rodent populations and so they play an important role in maintaining community structures and ecosystems. It is believed that the Black Harrier has lost about 50% of its preferred habitat over the last century due to habitat transformation because of agricultural activities and burning of fynbos and grasslands. This causes these habitats to become unsuitable for breeding for approximately five years. Harvesting of crops generally coincides with the middle of the harrier breeding season. The Black Harrier only nests on the ground and therefore it is doubtful that pairs breeding in wheat- or barley fields could successfully raise a significant number of juveniles. Other causes of habitat loss are alien vegetation and urbanisation and there is concern that wind turbine blades placed inappropriately might cause a serious threat to the harriers causing significant mortalities. Breeding is now highly dependent on protected areas where pristine and ideal breeding habitats still exist and it has nearly disappeared from agricultural lowlands. As a result of its small population and restricted range, the Black Harrier is classified as Near Threatened within its South African range and globally Vulnerable with an estimated total world population of 1000 to 2000 birds. The genus Circus is comprises of 16 species that are found worldwide. Africa has four resident species: the Black and African Marsh Harrier found on the continent and the Reunion and Madagascan Harriers found on the Indian Ocean Islands. The Reunion Harrier is probably the world’s rarest and most endangered harrier. As a genus they are more threatened than most other raptors, probably because their wetland and grassland habitats are often fragmented, degraded or ploughed up for agriculture. Barnes K. N. 2000. The Eskom Red Data Book of Birds of South Africa, Lesotho and Swaziland. BirdLife South Africa, Johannesburg. Brown L. H., Urban E. K., Newman K. 1982. The Birds of Africa. vol I. Academic Press, London. Fuchs J., Simmons R. E., Mindell D. P., Bowie R. C. K., Oatley G. 2013. 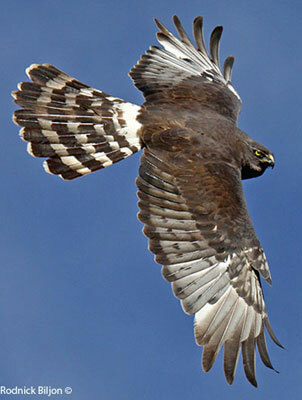 Lack of mtDNA genetic diversity in the Black Harrier Circus maurus, a southern African endemic. Ibis 156: 227–230. Harrison J. A., Allan D. G., Underhill L. G., Herremans M., Tree A. J., Parker V., Brown C. J. 1997. The Atlas of Southern African Birds. BirdLife South Africa, Johannesburg.